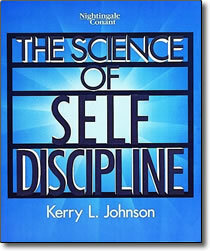 The Science of Self-Discipline CDs by Kerry Johnson – Discount! At Last There’s a Way to Put an End to Procrastination and Make Self-Discipline Automatic! Self-discipline is the ultimate key to achieving any goal and realizing any dream: losing weight … improving relationships … eliminating debt … building wealth … and more. And now, becoming highly self-disciplined is easier than you ever thought possible! By artfully blending proven-effective techniques adopted from behavior therapy, cognitive psychology, and the science of Neuro-Linguistic Programming (NLP), Kerry Johnson has devised a program that will empower you to exercise perfect, consistent self-discipline — AUTOMATICALLY. Kerry brings a whole new dimension to the techniques of re-framing, association/disassociation, mirroring, modeling, anchoring, and many others as applied to the world where you perhaps now dwell — the world of the undisciplined. With his guidance, you will envision a life in which you can practice the self-discipline you seek. And envisioning such a life is the first stop toward living it. These principles really work. If you’ll put these life-changing ideas into action, everything you do will be easier. This program gives you a simple step-by-step plan for putting these powerful strategies to work in your life quickly, so you’ll start to experience fantastic results right away. Once you’ve implemented the habits of self-discipline at the subconscious level, you will find that goal achievement becomes virtually automatic. Without even trying — almost without thinking about it — you will direct all your thoughts and actions towards what you want to accomplish, and reach it in record time. No matter what habit you want to break … no matter what goal you want to reach … no matter how much difficulty you’ve had in the past, The Science of Self-Discipline works like magic!